Elke Baker, 1995 U.S. National Scottish Fiddle Champion, combines lyrical melodies with driving dance rhythms in her energetic fiddling. Elke plays Scottish, Celtic, and American fiddle music for concerts, festivals, dances, and parties across America and abroad. Click the "Biography" link to learn more. Elke frequently plays solo at concerts and festivals and occasionally for dances. She also plays in a number of bands. 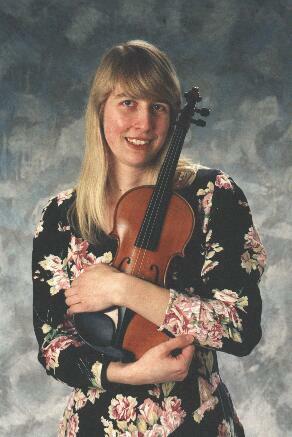 Click the "Performance" link to learn more about her bands and ensembles. As a soloist, she has played at a great range of venues including the Kennedy Center, Hawaii Academy of Arts, Institute of Musical Traditions, Maryland Early Music Festival, Cambridge Concert Series, and the legendary Eagle Tavern in New York. Elke also plays with a wide range of talented collaborators and accompanists for concerts, festivals, and private events. Elke has played with Robin Bullock, Alasdair Fraser, Hesperus, Muriel Johnstone, Seamus Kennedy, Ken Kolodner, Zan MacLeod, Chris Norman, Sue Richards, Terry Traub, Larry Unger, and many others. Elke plays in a wide variety of venues. She plays for dances, festivals, concerts, private parties, and weddings, to name a few. Click the "Upcoming Events" link to see her performing schedule. Elke has recorded four CDs. Click the "Recordings" link to learn more.